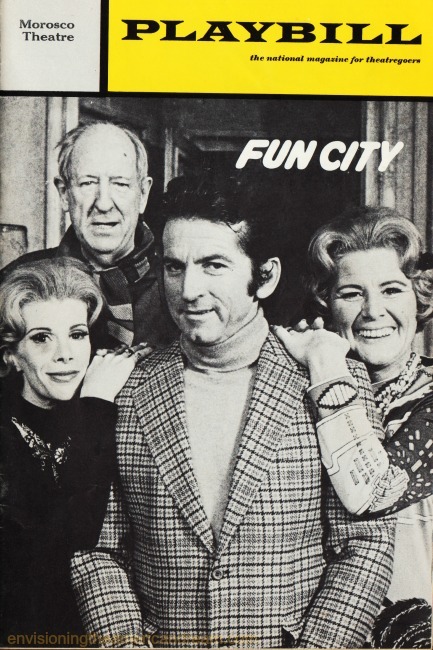 “Fun City” a 1972 Broadway show co-written by Joan Rivers who co-starred with Paul Ford, Rose Marie and Gabriel Dell. This short-lived show ran but a week. It’s opening date was Jan 2, 1972 closing Jan 8, 1972. Today we bid farewell to a quintessential New York dame – Joan Rivers. Co-written with husband Edgar Rosenberg and Lester Colodny, the comedy imagined what life might be like in NY in the immediate future and how romance may be conducted there. That very funny lady will be sorely missed. Her bio that appeared in Playbill’s Who’s Who is exhaustive, but just the tip of an iceberg of what would be a very long prolific career. I loved her acerbic wit! No one was safe, not even Joan Rivers, when she touched them with her comedy. A lovely tribute. Lucky you to have seen her in a live performance! There was no one else like her or who had her longevity. From her first appearance on Ed Sullivan to the red carpet, it seems Joan Rivers as always been a part of our popular culture, mocking it as much as she mocked herself. How true, Sally! I remember watching her on Ed Sullivan, thinking she was pretty phenomenal and bright for that program. Not to say Ed Sullivan didn’t have something of value to it, just that it was kind of like an upbeat Lawrence Welk old peoples’ show to me when I was a kid. With three channels on the television here at the time, Sullivan was the best program in that time slot on Sunday evenings. Wer’d have supper at my grandmothers, watch Ed Sullivan, whatever followed, then return home. Joan Rivers was doubly funny, I think, because she always dressed like the sophisticated New York lady she was. Everything perfect and in place, but that mouth kept saying these very outrageously funny things that had me on the floor laughing! “She didn;t really say that, did she?” Oh yeah! I think it was that incongruity of a polished well dressed woman espousing the things she said that was so startling, daring and hit a cord with so many. Unlike say Phylis Diller who dressed and looked a bit over the top, Joan always appeared very ladylike which made it all the more disarming.